An external print server to connect up to 4 printers or MFPs to most major networks using Gigabit Ethernet with RJ-45 connector. Supports the TCP/IP (IPv4 and IPV6) application services and is compatible with popular operating systems including Novell NetWare, Microsoft Windows (98, Me, NT, 2000, 2003 and XP) as well as UNIX, Linux and Apple Mac OS. With embedded printer pooling support, the MarkNet N7020e allows print centers to distribute print jobs across up to four printers. This feature saves time and balances workload by routing print jobs to the next available printer. SSL* protocol secures PDF direct printing and connections to the device's embedded web server to protect configuration and device status messages. SNMPv3 supports encrypted and authenticated management traffic protecting remote configuration and device status messages. IPSec can be used with both TCP/IP IPv4 and IPv6 networks and provides encryption and authentication of communications at the network layer. *This product includes software developed by the OpenSSL Project for use in the OpenSSL Toolkit. Print over a limited bandwidth network with minimal impact to response time for use in Citrix MetaFrame and Microsoft Windows Terminal Services Environments. Features include 1) Enable and disable ThinPrint, 2) Change ThinPrint IP port, 3) Change block size and 4) Control bandwidth. The MarkNet N7020e print server offers network printing support for up to four laser, inkjet, and dot-matrix products. 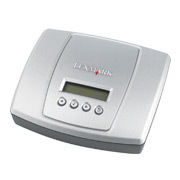 In addition to printing, the USB print servers offer network scanning support for select Lexmark All-In-One products. Remotely administer device settings through a web browser using the Embedded Web Server. With HTTPs support, administrators can modify print server settings, monitor printer status and update settings on select Lexmark printers over a secure channel. MarkNet N7000 series print servers support IPv6, the next generation of TCP/IP. This feature allows workgroups to use existing printers with next generation networking standards. MarkNet N7020e offers benefits to workgroups with established networks by supporting legacy protocols such as TCP/IP (IPv4), IPX/SPX and AppleTalk . With IPP 1.1, MarkNet N7000 Series print servers allow users to send encrypted print jobs over the Internet. MarkNet N7020e print servers offer the ability to configure the device and update firmware using a USB flash drive. This model offers extended support by allowing users to send select print jobs from a USB flash drive to any printer connected to the print server. 1Този продукт включва развит софтуер чрез проекта OpenSSL Project който е за OpenSSL Toolkit менюто.